Congrats on choosing to WOW your life! Tell us where to send it! 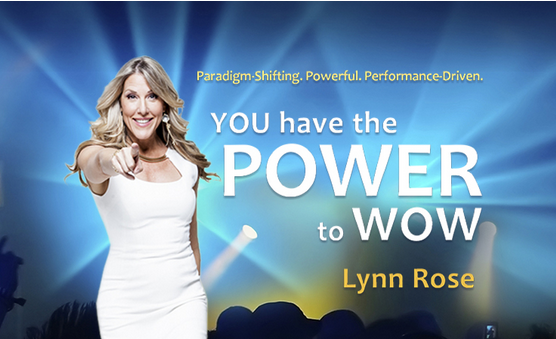 Create The WOW Experience with Lynn Rose! and how she gets your audience on fire, inspired and taking action! For over a decade, Lynn Rose, WOW Performance Keynoter, Award-Winning Entertainer , TV Host and CEO of Launch You Now and The WOW Factor, has brought WOW Performance to hundreds of thousands around the world through her High-Impact Emceeing, Electrifying Entertaining and Exciting High-Performance Keynote, "The Power To WOW". As countless organizations, meeting planners and producers attest to, ‘No One Opens a conference like Lynn Rose”. She’ll get your attendees on their feet, engaged, inspired and on fire for what you want them to feel and set up for taking action, setting the tone for a WOW of an event. You’ve seen Lynn on CBS, and other top TV networks, on film, Broadway and more. Whether sharing the stage with Stevie Wonder, Mariah Carey or Jay Leno — or leading her WOW Performance Keynotes and Trainings for billion dollar CEO’s, entrepreneurs and professionals, Lynn Energizes, Engages and delivers High-Performance Results on WOW. She is CEO of two 6-figure businesses and has helped launch 6- and 7-figure careers with her media and marketing expertise, while motivating, training or performing internationally for major events. Lynn is hired by Fortune 500 corporations, prominent associations, direct sales companies, financial professionals and entrepreneurial events to bring the WOW Factor to their event, creating an epic experience while empowering their attendees to stand out in their sales, leadership and communication with a high achiever's mindset for WOW results. "You Have The Power To WOW"
The Entertaining yet Powerful Call To Action To Get your Organization On Fire, Inspired and Ready To Take Action. Turn them into WOW-Makers and skyrocket their bottom line, along with their sense of purpose, direction and motivation. Perfect for Sales, Leadership, Teamwork, Franchises and Associations. Learn in the most interactive, fun and powerful way how you can shift your results with clients, audiences, pitches and marketing videos, no less interaction with your team through the WOW Speaking Performance Formula. See stunning Before and Afters and have your own onstage with on the spot makeovers in minutes. Lasting RESULTS! Specially targeted for entrepreneurs, this Interactive, eye-opening presentation shows you the 5 Elements you need to WOW your career and accelerate to the top of your industry following these essential elements for WOW Success. Before and Afters that will stun you. On the spot Hot Seat Coaching with audience members and designed to empower the audience to take whatever industry they’re in and position themselves at the top. Dive inside the science behind what’s been keeping us stuck and the shockingly simple way to move beyond it. Participants will have a whole new skill set for connecting with others for networking, talking to clients, relationships, team members they lead or colleagues that ignites a whole new sense of confidence, effectiveness, well-being and the super power to stay motivated, even in challenging times. Learn in the most interactive, fun and powerful way how you can shift your results with clients, audiences, pitches and marketing videos, no less interaction with your team through the WOW Speaking Performance Training. See stunning Before and Afters and have your own onstage with on the spot makeovers in minutes. Lasting RESULTS! Specially targeted for entrepreneurs, go deeper in this hands-on training that reveals each of the 5 Elements you need to WOW your career and accelerate to the top of your industry. Before and Afters that stun you act as powerful guides on what to do (and what NOT to do) On the spot Hot Seat Coaching with audience members take the learning to a whole new level. All designed to empower the audience to take whatever industry they’re in and position themselves at the top.